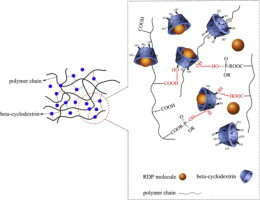 We describe the preparation and characterization of a green and renewable polyelectrolyte complex (PEC) containing phosphorus, nitrogen and carbon elements, based on the ionic complexation between chitosan and phytic acid. Introduction of this PEC to ethylene-vinyl acetate copolymer (EVA) leads to an improvement of the flame retardancy. As for the EVA/PEC composites with 20.0 wt % of PEC (EVA/20PEC), the char residue at 600 oC is 12 wt % higher than that of the pristine EVA under nitrogen atmosphere. Compared to the pristine EVA, the peak heat release rate and total heat release of EVA/20PEC show 249 W g-1 and 5.6 kJ g-1 decreases, respectively. The char residue of EVA/20PEC is full and compact, demonstrating excellent intumescent effect. Introduction of this PEC also contributes to a slight increase of the Young’s modulus while maintains the excellent ductility. This work provides a new approach for the development of environmentally friendly intumescent flame retardant system.